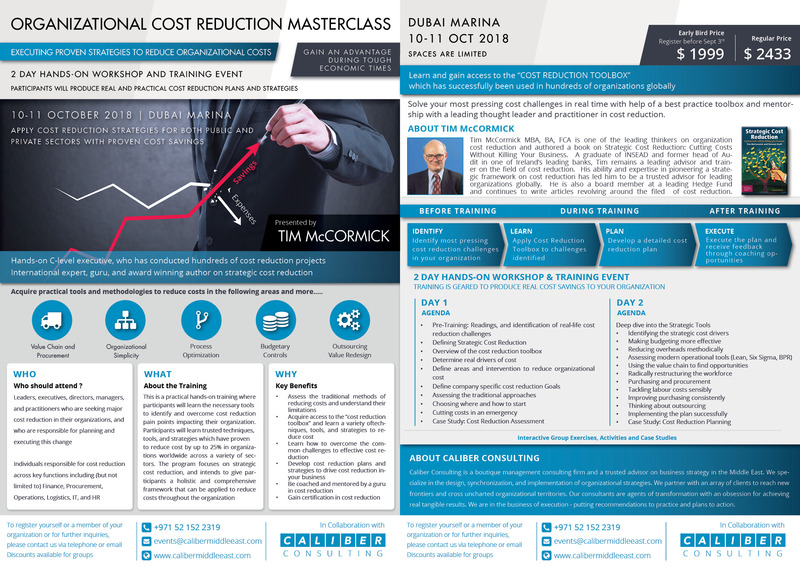 This training will be conducted by renowned international guru and author Tim McCormick, a hands-on C-Level executive who has conducted hundreds of cost reduction projects. This is a practical hands-on training where participants will learn the necessary tools to identify and overcome cost reduction pain points impacting their organization. Participants will learn trusted techniques, tools, and strategies which have proven to reduce cost by up to 25% in organizations worldwide across a variety of sectors. The program focuses on strategic cost reduction, and intends to give participants a holistic and comprehensive framework that can be applied to reduce costs throughout the organization. Don’t miss your chance to enroll in this course and start making change happen in your organizations.